Right away the greatest thing about this series (and perhaps of the entire playoffs) is the Game 1 pitching match-up between Roy Halladay and Tim Lincecum. 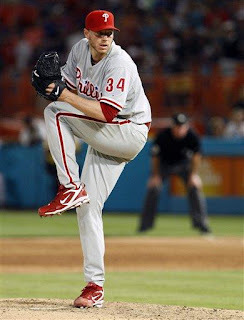 Last week, in his first playoff game ever, Halladay threw a no-hitter (joining Don Larsen atop that seemingly unreachable mountain peak) and the next night Lincecum threw a game that somehow might have actually been better, striking out 14 and only allowing 2 hits in a complete game shutout. Something's gotta give in this terrific match-up and, as the two supreme aces figuratively cancel each other out with their awesomeness, it's the batters that have to step up and outdo each other. While Lincecum might strike out 23 guys and Halladay, if he needed to, could efficiently cruise into the early east coast morning without allowing too many baserunners, one of the lineups has to eventually put up a run on the board in order to win. I'll take the Phillies to do that. And, in a battle between two teams with excellent pitching staffs, the Phillies' superior lineup should prove to be the difference. Let's take a look at each team's four best hitters, ranking them by a Baseball Prospectus stat called True Average (it looks like batting average but it's a combination of all their offensive production--power, walks, even steals--in one number). Huff had the best year of his career at 33 and has really seemed to find his happy place in San Francisco, while Werth has been a major part of this new Phillies dynasty since he arrived in 2007, posting his best numbers this season in the last year of his contract. I love Werth's hitting ability, he's all-around awesome with plenty of doubles, homers, walks, and steals and (really going out on a limb here) I anticipate some sort of heroics and fireworks from him in this series as it could be his last go-around with the Philly band. Utley didn't have his best year because of a thumb injury he had to have surgically repaired which probably effected his hitting, but even in a bit of an off year he still finished #3 among all second basemen in True Average (behind Robinson Cano--almost typed "Canoe"--and Dan Uggla). When at the top of his game, Utley is probably the best hitter in this entire series. As for Burrell, the former #1-overall pick of the Phillies has enjoyed a renaissance in his twilight. After being dumped off into the trash bin by the Phils last year and then the Rays this year, the Giants scooped him up off the street and he's meshed well with the other early-30s cast offs, putting together his best season at the plate since 2002 by OPS+. Maybe he just didn't like the American League (or having to DH). Cool to see both catchers here. Between catching two no-hitters (and a great pitching staff) this season and also recording his best year with the bat (.400 OBP), Ruiz has been a major part of this Phillies steamroller. He's also becoming something of a postseason star for the Phils as he's put up a .904 OPS in 35 postseason games the last few years. His counterpart here is no slouch, in fact he's pretty awesome and I predict he'll be a local cult figure in San Francisco for years to come. Just like his experienced mitt-mate, Posey has been behind the plate catching for a very successful pitching staff and he's also thwacked. The kid is a line-drive machine, an extremely polished hitter for 22 years old, and he can hit both righties (.832 OPS) and lefties (.955). 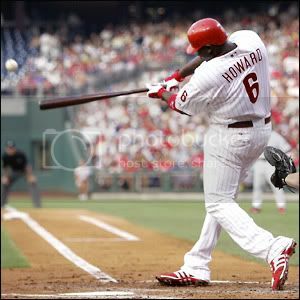 I'll be very interested to see what he does at the plate against Halladay. Can the Giants possibly knock off the Phils? The way they've closed out the season (23-7 since September 1st), the Phillies look like a Harrier jet on autopilot cruising towards a reunion clash with the defending World Series champion Yankees. And so, really, the question going into this series is whether or not the Giants can win. As much as I love Tim Lincecum, I don't think he'll be able to carve through three encounters with this Philly lineup unscathed and neither will Matt Cain. San Francisco's duo of starting lefties, Jonathan Sanchez and Madison Bumgarner, pose a threat to the chances of an easy sweep by the Phils and I think it will certainly be an exciting series to watch, but the Phils will take it in 5.